Those are some very cool colours. You must make the best tasting fruit salads in Australia. I had the pleasure of trying one of these at the University of California's citrus research station in Riverside a few years ago. Really interesting and good fruit. I was not aware of the reddish ones, however. I have to see if I can get me one of those! You could try the Lismore Herb Festival on August 19 & 20 there are usually some bush food stalls with tasting and local chefs demonstrating how to cook with our local bush foods. Does Finger Lime always has pink/purple flower buds? How to tell the difference between Finger Lime and Mt WHite Lime? The finger limes have pink buds with pretty little triangular white flowers. Many variety are flowering and fruiting now. They say "It is similar to the finger lime, but has broader leaves (Alexander, 1983). The flowers are single, axillary and the tree bears fruit from April to November (Cooper, 1994). The fruits are also 'finger-shaped', with a green skin and greenish-white pulp on maturity. The fruit have fewer cells than the finger lime and a thicker skin (up to 2mm) containing large oil glands and weigh an average of 25g." 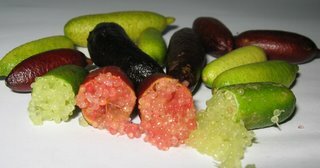 Can finger lime fruit be puchased in shops in Brisbane? There are some great nurseries in Brisbane that may have Finger Limes and if not you could contact them to order some from us. Finely crush biscuits and mix with the melted butter to form the biscuit base. Press into the base of a 20cm wide springform tin and refrigerate until ready to use. Whisk the egg yolks and sugar until thick and creamy. Whisk in softened cream cheese. Extract the finger lime pulp by slicing fruit lengthwise and scooping pulp out with a teaspoon. Remove the seeds and discard. Fold the finger lime pulp into the cheese mix. Add Tahitian lime juice and rum to taste. Add gelatine to water and dissolve gently. Fold into the mix. Whisk eggs whites until thick and fold into the mix. Pour the whole mix into the lined tin and refrigerate. Decorate cheese cake with different coloured slices of finger lime. Wash fruit and cut into thin horizontal slices, discarding any seeds. Place fruit in a saucepan and cover with water. Allow to stand overnight. Next day, boil fruit until skins are soft (approximately 10 minutes). Then, add one cup of sugar to each cup of pulp. Boil briskly until it jells. Bottle and seal while hot. * 1 small clove of garlic, chopped. Combine all ingredients for coleslaw except peanuts, in a bowl, and set aside. In a separate bowl combine all ingredients for dressing , whisk until sugar dissolves and season to taste. Pour dressing over coleslaw and toss well. Sprinkle with peanuts and serve immediately. Kath It's great to see an interest developing in the Finger Lime. Your photos, presentation and colours are great. Additional recipes can be obtained from www.fingerlime.com. Please be aware that fresh oysters, a squeeze of tahitian lime topped with finger lime pulp is arguably the most pleasing taste sensation you will achieve. What soil type is requied to grow finger limes? Will they grow at Woodburn? i was wondering if i can buy finger lime trees or any other native varieties in north west victoria. Can you get the verious collors specificaly, and have them easily identifyable? I have a Finger Lime tree that I bought at Daleys last August, how many different varieties do you sell as the website is non specific ? Also how long do they take to reach a maturity and bear fruit ? Can anyone tell me if I could grow these in the south west of Westen Australia eg Bunbury. Thanks. How long from flower/bud to fruit? I saw these in Borough Market in London - they look fantastic. Do you know if they would survive as a houseplant in the UK? I doubt you would acheive fruit but they would be a great curio. I assume as a sub-canopy species in the forest they would just about survive our lower light levels? I guess it's too late in the season to get some fresh limes, but do you know if anyone has any frozen? I live in the Northern rivers area. Thanks. Are they available in Adelaide? great, interesting product. can anyone tell me how to grow finger limes from seed.I have a bag of seeds but no idea how to start the growing process! Angus Stewart's "Let's Propagate" suggests best propagation is by semi hardwood cuttings, with no mention of raising from seed. Hi - I have just received my shipment of fingerlimes (tube stock) and I am wanting to plant - can I plant these near camphor laurels - I have other citrus growing in the area - or should I go for full sun. i learn about this fruit pn tv. does anyone know where i can try finger lime fruit in the west of sidney please?